Seated, or Onsite massage, is good for a very specific problem (e.g. tense neck or shoulders) and if you have limited resources. In just 10-15 minutes you could feel lifted. It is a different massage experience but with similar strokes to swedish massage. The key difference is that you are clothed and seated (see photo) and no oils are used. The major benefit is that you can be treated almost anywhere as there is no need for a large table. A mixture of strokes and holds are used and specifically for an acupressure seated massage, I work on pressure points. This massage always finishes with envigorating strokes to enable you to continue on your day as it is often done in the workplace. It is not suitable for some stages of pregnancy, and there are some other conditions where it may not be recommended. 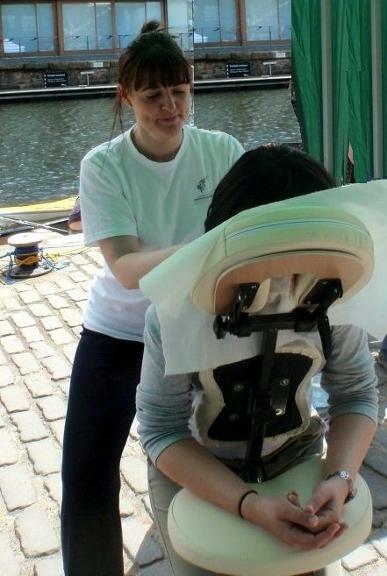 I bring the massage chair to your workplace for staff health and wellbeing days, or for promotional events. Please contact me for more details.